I just had a baby, when can I join? You can begin attending class with your doctor's clearance to begin exercising, typically after your six week postpartum appointment. Stroller Strides, Stroller Barre and Body Ignite are perfect for newly postpartum women. See you there, Mama! Absolutely! 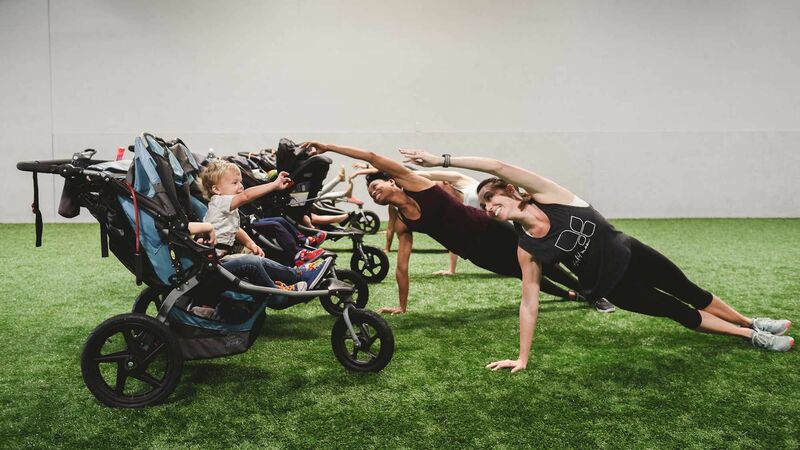 Fit4Baby prenatal classes, Body Ignite, Stroller Strides and Stroller Barre are perfect for expectant mothers. Even if you haven't been exercising prior to your pregnancy, you can start a program while pregnant. Instructors are qualified to lead our professionally designed pre/postnatal fitness programs that follow the latest American College of Obstetricians and Gynecologists (ACOG) guidelines. We can modify any exercise that poses a challenge as you progress through your pregnancy. FIT4MOM® recommends you obtain your doctor’s approval prior to beginning a fitness program. If pregnant, please speak with your physician before your first day. In case of inclement weather, outdoor class locations may change. Always register for your class online so we can alert you and be sure to check for updates an hour before class starts. We also send notifications to our client list via text. Sign up using the link in our weekly emails. Currently we have shelter for all Stroller Strides & Barre classes when it rains except for Silver Lake. In case of heavy rain, Silver Lake classes are cancelled. No. This workout is not intended for prenatal exercise and we do not recommend following the meal plans during pregnancy. If you become pregnant during the course of your Body Back session, please notify your instructor. We offer Body Ignite, FIT4BABY, Stroller Strides, and Stroller Barre as appropriate prenatal exercise programs. For BODY BACK Transformation sessions, pre-register to ensure your spot in the class. Body Back sessions sell out quickly, so you want to hold your spot by registering early. Sometimes we will issue an invoice upon your request. You will not be guaranteed a spot until the invoice is paid. For BODY BACK Community classes or BOOST classes, pre-register so your instructor knows to expect you and can contact you if there are any changes to the class. We require a minimum number of clients to be enrolled in order to offer class. If you cannot make it to class, you need to cancel with at least 24 hours notice or you will be charged for the class. Run Club is stroller friendly. Any child that joins you for Run Club should be safely secured in a stroller. All of our routes are stroller friendly. Please note that you don't have to have a child in the stroller to participate. We have moms of all ages and stages who participate in Run Club! You do NOT have to be a member of FIT4MOM to join the FIT4MOM Our Village Weekly Playgroup. All moms are welcome! This is a FREE group! A 30-day notice is required to cancel your membership. You must cancel with a written request to katguessard@fit4mom.com A copy of the policies can be found on the website. Visitors are welcome to come to one class FREE of charge! If you have an extended-stay guest who would like to participate in more classes, they will be subject to our regular drop in class rate. All visitors must sign our waiver in order to participate. Email katguessard@fit4mom.com to change the status of your membership. All requests need to be received in writing at least 15 business days before the next payment is due. Memberships will be placed on hold for a minimum of 3 weeks or a maximum of 4 months up to two (2) times per calendar year. You must provide the start and end date of your hold in writing via email. Holds can start any day of your billing cycle. Our system auto-prorates your membership upon release of your hold. There are no refunds on dues once payment has been paid. To avoid payment, all requests need to be received in writing at least 15 business days before the next payment is due. You can return from your hold on any day of the month. You need to email katguessard@fit4mom.com to notify us if you need to change the date. If you attend class without letting katguessard@fit4mom.com know, your hold will automatically end. For Stroller Strides memberships: When your membership is on hold you can attend classes at the current drop-in rate for your class. Your credit card on file will be charged automatically. In some cases you may choose to purchase a class pass while your account is on hold instead. For Body Back memberships: When your membership is on hold you can attend classes at the current drop-in rate per class. Your credit card on file will be charged automatically. In some cases you may choose to purchase a class pass while your account is on hold. There is a $79 enrollment fee for all new monthly memberships. If you sign up for membership on the first day of class you pay a $59 enrollment fee. The enrollment fee pays for your equipment and helps to fund our free weekly playgroups. We provide all the materials for you! If you cancel your membership and then wish to rejoin, you pay a half of the current registration fee to rejoin. Stroller Strides members who transfer to us from another franchise outside will be charged a half of our current enrollment fee. There is currently no registration fee for all BOOST memberships, except BOOST All Access. There is a $25 registration fee for this program. *Prices & Policies are subject to change and are set by each individual franchise.